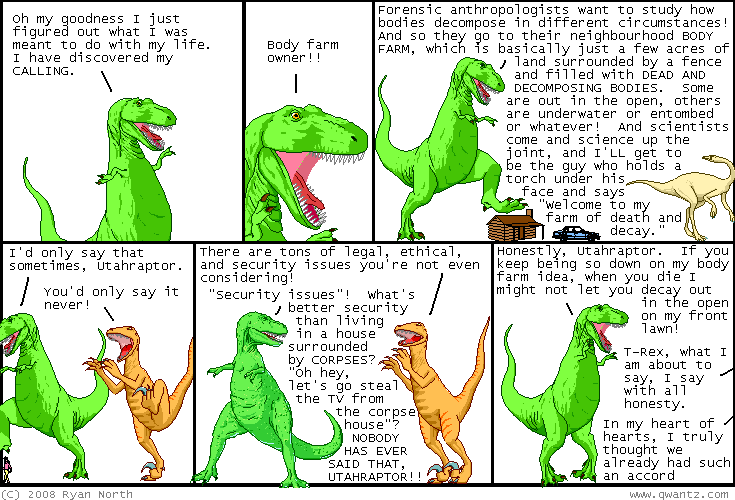 Dinosaur Comics - December 4th, 2008 - awesome fun times! –But maybe it is though!! December 4th, 2008: Everyone here are some awesome things for you! First up is Is It Funny Today, a site that lists the latest updates from webcomics and allows you to vote on whether or not they're funny, and see the funniest comics out today. It just launched and I think it'll be a great way to find other funny comics on a daily basis! Notice how in that last sentence I presupposed that you think my comic is funny. Oh yes. This is the Power of Language. I also wanted to thank everyone who let me know that Dinosaur Comics stuff is showing up in the background of the new season of The IT Crowd! There's tons of webcomics stuff there if you keep your eyes peeled: I spotted Rich and Jon and myself and that was only in the first five minutes! If you get a chance to watch this show, I really recommend it. Last season's opening episode ("The Work Outing") was a perfect 22 minutes of television, I think. Finally my friend Chris pointed me to this charming AND informative infographic-style video on food on Japan, and in viewing the related videos I came across these three videos done by the same company and in the same style, which I love SO HARD. The style is great, but what I like so much about them is the main character, that faceless guy in a blue shirt. Guys, I think - I think I want to be him. Everything he does is great and the way everything syncs up at 3:10 in this one makes me laugh every time. CHRISTMAS: It is the time of year where I have to remind you about Christmas. But I have an excuse! Here in online land it takes some time to ship things to you and yours, so if you want totally awesome Dinosaur Comics clothing to arrive in time for Christmas, you have to order soon. If you're shipping to a non-US address, you should order with Global Priority, Express, or UPS shipping to get things in time - regular shipping might not do it! With these express shipping options, you can push Christmas ordering for international orders up to December 12th. And if you're shipping to a US address, you should order before December 17th. Also! New in the store and pictured above is a T-Rex's Busy Day Hoodie that is warm and huggable and awesome, which coincidentally are properties I'm sure are also shared by the person you may want to buy it for!! One year ago today: a deleted line had t-rex explaining how television is like combination vision-o-vision and audi-o-vision. then *I* was gonna say, "car fans: audi-o-vision is not what you think it is, and you 'audi' be less obsessed about cars."